This story has been generating lots of buzz around town and on conservative media organs across the nation: High Bridge Arms at 3185 Mission Street in Bernal Heights, San Francisco’s last remaining gun shop, plans to close by the end of October. Dear friends and family, it’s with tremendous sadness and regret that I have to announce we are closing our shop. For many reasons I cannot get into at this moment, it appears our final days will be through to the end of October of 2015. We will clearance out what ever inventory we have in the shop and offer sale prices for anything you would like us to order. This is not a joke. For any of you Vultures, (you know who you are) please don’t bother us. For if you do, I give you my solemn promise that we will make it a very unpleasant experience for you. For all our true friends and followers, I would like to sincerely thank you for all your support, likes, positive feedback and best of all, your friendship. Hopefully, we’ll see you soon. 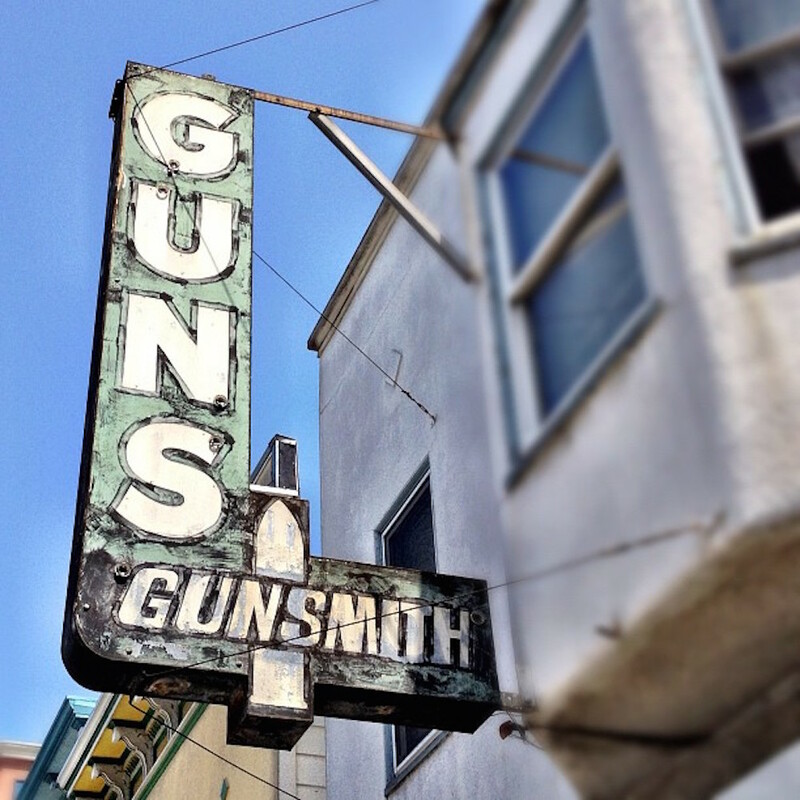 It has been a long and difficult ride, but a great pleasure to be you’re last San Francisco Gun shop. Our warm regards, High Bridge Arms. If this sounds like ripe fodder for Fox News, well, rest assured, they’re on it. Ever since it was opened in the 1950s by a celebrated Olympic shooter, High Bridge Arms has been a defiant fixture in San Francisco’s Mission District, (sic) but a coming wave of new firearms restrictions has prompted the last gun shop in the liberal City by the Bay to pack it in. The proposed new city regulations, which could only be aimed at High Bridge Arms, would have required the shop to take and preserve video of all transactions and turn customers’ personal data over to police on a weekly basis. General Manager Steven Alcairo said the shop’s owners finally threw in the towel after years of what they consider being unfairly targeted with burdensome rules and regulations. Past regulations have required the shop to bar ads and displays from its windows and install cameras and barriers around its exterior. The shop has 17 cameras as it is, and turns video over to police on request, he said. “This time, it’s the idea of filming our customers taking delivery of items after they already completed waiting periods,” Alcairo said. “We feel this is a tactic designed to discourage customers from coming to us. To be sure, a great many Bernalese will be glad to hear High Bridge Arms is closing. That’s understandable; the gun shop has long been an incongruous part of our local landscape, and gun violence is a disease that plagues our city and our nation. Bob Chow […] was born in 1911, in the U.S. to Chinese immigrant parents and passed away in 2003. He was a pioneer ham radio operator in his youth. He joined the Navy Reserve in the early 1930s. He became a noncommissioned officer, a rarity then for an Asian American. Bob established 37 world pistol records, and in 1948 qualified for a place on the U.S. Olympic Team and competed in London. He was the first Chinese American to compete in pistol shooting in an Olympic game. Bob was the only U.S. rapid-fire shooter to score 60 hits in the match and placed 13th overall. After returning from the Olympics Bob coached young American shooters and raised the standard of American gunnery to competitive internationally. During his stint as a movie extra he taught John Wayne, Roy Rogers and others how to increase their accuracy in pistol firing. Bob was an all around sportsman and loved motorcycles. Bob played saxophone and banjo with American jazz groups during the Prohibition days following World War II. Eventually he and his wife Bobbie settled in San Francisco where he owned and operated a gun shop. High Bridge was a juxtaposed holdover from the midcentury, working-class Bernal Heights that was here before almost all of us — before the Summer of Love, before Santana in the park, before the SLA, the Esmeralda Slides, BHNC, the Good Life, the coffee shops, the Subarus, the Priuses, and plenty of other events and symbols that reflect the sensibility Bernal Heights is known for today. High Bridge was an icon of diversity of a different sort, and even if you never liked it, or only barely tolerated it, it always provided a tangible reminder of different ways of looking at the world, and our own neighborhood. This is very unfortunate. I hate seeing liberal turds hurt honest businesses like this. Instead they should be focusing on cleaning out the transients that need to go somewhere far away (we pay a lot of money to live here, and don’t see that money being used wisely on things like cleanliness and education). This handout, shelter city mentality will continue to ruin SF. Can’t wait to move to Marin! Wish supporters of the 2’nd would get just as upset for the real violations that are happening with the 4’th. Look at what is happening with your electronic communications. Point taken, and I agree that the violations on the 4th are worth understanding and fighting against. I’m pretty sure, however, I can be aware of and against more than one issue at a time. Just like I can chew gum and walk, believe it or not. Not to mention, that last I checked these violations never caused multiple school, workplace, theater, political rally, street-based massacres leaving innocent victims dead, many of them children. Please remember, these guns were, in many/most cases, purchased perfectly legally. I am happy to take on the Liberal Turd moniker if that’s how you define someone who wants common-sense gun control, and no gun shops in her neighborhood. I don’t think any of us have any evidence that this was any more than the regular store closes due to rent increases kind of deal. If you have evidence that it was us “Liberal Turds” that closed that store down, then I’m all ears. I personally won’t be shedding any tears for the loss of this business. Danny – Allow me to clarify. I did not define “common sense gun control laws” as not having any gun shops. I said I am for common sense gun control while ALSO for living in a neighborhood without a gun shop. Frantik – You didn’t need to clarify. It was pretty clear how hypocritical that sentence was. If you don’t like liberals, Marin is not exactly the best place for you to move to! You’re right that High Bridge Arms was a local, independent business with good prices and great customer service, and I too will be sad to see them go. I’m a liberal and I shopped there and I agree with your assessment of “liberal turds”. However…. Your attack on the homeless comes out of nowhere and is totally unrelated and just goes to show what a wretched person you must be. Only people who hate themselves have the capacity to hate the most vulnerable. Wow. Ain’t that the pot calling the kettle black! Not sure how that expression applies here – care to elaborate? I don’t know who the Vultures are, but words like these coming from people with a lot of guns in the neighborhood certainly are not an icon of Bernal’s diversity of ANY sort, just a threat. Good riddance. It was the “Vultures” remark that made me wonder if this is all just a bitter cover for profits not being sufficient to continue operations. Every time I passed that shop I always wondered how they brought in enough business to survive in SF. At one time I’m sure plenty of San Franciscans owned guns and hunted regularly, but that seems like an anachronism nowadays. Even as someone who supports gun control it’s clear who they mean by “Vultures”. Give it a rest, you chased the last gun shop out of SF. Hey SciLaw, it’s not clear to me who the “Vultures” are. Are they real estate investors waiting to scoop in when the gun shop shutters? Enlighten us. Anyway, the frightening words were “we will make it a very unpleasant experience for you”. Gun control or no, I’d prefer a neighborhood empty of thugs with an arsenal of guns. I did not even know the gun store was still there until I read this post. I thought it was long ago closed, with the signage kept as a reminder of the Wild West days (kinda like the Discolandia sign is still up above the 24th St. $9.00 hot dog eatery to remind us of what the Mission used to be). They’re not thugs Marcelo. Do you honestly think they’re threatening someone with gun violence? Get real. Go in there and talk to them before making a snap judgement on an ambiguous term that you admit you don’t even understand. Danny, I am sure that to you they are very reasonable non-thuggish people. Some people (my wife and daughters primarily) see me as very nice (I think). But if I were to tell you don’t post replies to me or I “will make it a very unpleasant experience for you,” I’m pretty sure you would not take it as a respectful or neighborly message. The only thing I do not understand is who the Vultures are (not what the term means). I prefer not to have a gun shop in the neighborhood, but it’s not something I have thought much about until I read here that a gun shop neighbor is making thuggish threats, then my “snap judgment” is to hope they get on their horse and ride towards the sunset right outta town. Seriously naive…. What you have is a business owner announcing a sale and defending against the inevitable. The real thugs are the ones who shot up Precita Park Cafe and I’m going to go out on a limb and say that those guns weren’t licensed and purchased through HBA. Yes, Danny, very naive. I even think that if the thugs who shot out PPC’s windows had written “stop selling meat dishes or I give you my solemn promise that we will make it very unpleasant for you”, you may have been alarmed. Now that we’ve settled that I am naive, please move on and take your dimwitted personal attacks elsewhere. spelled you name wrong and I guess my post can’t be edited! Thanks for the thoughtful comments about the gun shop being a reminder of the areas working class and middle class roots. That was the environment my Dad grew up in during the 30’s and ’40s before going off to war and then UC. He often talked of having to ride the bus in ’42-’43 from their home on Highland Ave out to Lowell HS (then on Masonic) wearing his ROTC uniform and carrying a rifle and sword. A different time for sure. I don’t own guns myself but I’ve never had any problems with the store. I pass it almost every day and everyone who works there seems nice, waving politely whenever I’ve stopped to appreciate whatever display they have going on with their Godzilla in the window . A friend of mine in Berkeley who does recreational sharpshooting comes over every once in awhile to purchase from them. As the article indicates, they add important historical color to the neighborhood and I for one will miss them. Great post. Thanks for putting this closing in context. Great a new store front for over priced pulled pork and sushi just became available! I would ask the supes exactly what problem this law is intended to address. Given that High Bridge was the sole remaining gun shop under their jurisdiction, it seems less like problem-solving than targeting a business they just don’t like. I disagree with the current court’s interpretation of the Second Amendment and lament the NRA’s gun-maximalist fear-mongering and insanity, but I can’t get behind this action. High Bridge Arms existed as a legal fraud. The license was NOT transferable, but Mr. Chow brought in his “family” to “help manage” the business. In reality he sold the business, in violation of the law. So, this “law-abiding” shop has been operating illegally since 2004. Interesting. You seem to actually know something about this issue, as opposed to the odd guesses (e.g. guessing game about “vultures” definition) which all seem to say more about the beliefs of the posters than anything else. BY THE WAY, the NRA used to favor gun control until 1968 when the Black Panthers began following the Oakland police to make sure the OPD weren’t harassing black folks. Then when the Panthers marched on Sacramento with guns drawn, the NRA suddenly dropped the gun control stance. The theory is that the NRA felt they should arm themselves against blacks. I’m guessing vultures either refers to 1) real estate flipper types looking to get the property cheap, or 2) people looking to offer pennies on the dollar for their remaining stock. My money’s on #1. @Judge Crater — I’m not seeing where it says the business owners owned the building. If they do, I’m surprised they didn’t close up years ago and lease to a more profitable business. I think it’s unfortunate. I’m not a gun guy — I’ve only fired one once, a friend’s police service weapon at a range — but I don’t like to see government actors showing contempt for our civil liberties. And I really don’t like the “make it a very unpleasant experience” talk, but I think I know the “vultures” he was talking about: anti-gun extremists who enjoy coming up with new, pointless regulations to make it more difficult to exercise Second Amendment rights, and then gloat when gun-related businesses respond by closing up shop. I’d be surprised if a single crime could be traced to a purchaser from this shop. I bought my pistol from here. Nice staff, good service. Very safe and relaxed environment – unsurprisingly as everyone is thoroughly background checked. I have my firearm solely for the purpose of protection in the event of a natural disaster. It sits permanently in a gun safe (except for once a year practice). I’m a moderate dem – even I wonder whether my progressive friends will regret not having taken the precaution of having a firearm if, say, an earthquake happens and law enforcement is immediately overwhelmed. It’s fine that you don’t like guns. I don’t either. But the people with bad intentions do have guns. So until they have definitively given up their weapons, mine will still sit in the safe. A Bit late to join the discussion, I know… But this place was in the news a few years ago.They were in danger of losing their business license because they are in a location zoned for retail, with a storefront, however they didn’t engage in retail business. They only supplied the police dept. The owners were bring forced to sell to walk in customers, or lose their license over a zoning violation. I thought this was completely bizarre. Receive new Bernalwood posts by email.